India was the ninth largest exporter of agricultural products in 2017. Agriculture start-ups is an emerging area, which can unleash umpteen opportunities for start-ups and strengthen the supply chain in India agriculture. 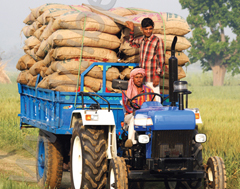 Agriculture is the primary source of livelihood for about 58 per cent of India’s population. Gross Value Added by agriculture, forestry and fishing is estimated at Rs 18.53 trillion (US$ 271.00 billion) in FY18. The Indian food industry is poised for huge growth, increasing its contribution to world food trade every year due to its immense potential for value addition, particularly within the food processing industry. The Indian food and grocery market is the world’s sixth largest, with retail contributing 70 per cent of the sales. The Indian food processing industry accounts for 32 per cent of the country’s total food market, one of the largest industries in India and is ranked fifth in terms of production, consumption, export and expected growth. It contributes around 8.80 and 8.39 per cent of Gross Value Added (GVA) in Manufacturing and Agriculture respectively, 13 per cent of India’s exports and six per cent of total industrial investment. During 2017-18* crop year, food grain production is estimated at record 284.83 million tonnes. In 2018-19, Government of India is targeting foodgrain production of 285.2 million tonnes. Milk production was estimated at 165.4 million tonnes during FY17, while meat production was 7.4 million tonnes. As of September 2018, total area sown with kharif crops in India reached 105.78 million hectares. India is the second largest fruit producer in the world. Production of horticulture crops is estimated at record 314.7 million tonnes (mt) in 2018-19 as per third advance estimates. Total agricultural exports from India grew at a CAGR of 16.45 per cent over FY10-18 to reach US$ 38.21 billion in FY18. Between Apr 2018-Feb 2019 agriculture exports were US$ 34.31 billion. India is also the largest producer, consumer and exporter of spices and spice products. Spice exports from India reached US$ 3.1 billion in 2017-18. Tea exports from India reached a 36 year high of 240.68 million kgs in CY 2017 while coffee exports reached record 395,000 tonnes in 2017-18. Food & Grocery retail market in India was worth US$ 380 billion in 2017. 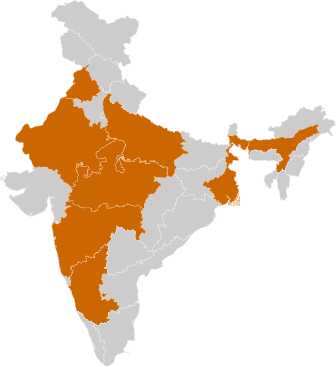 According to the Department for Promotion of Industry and Internal Trade (DPIIT), the Indian food processing industry has cumulatively attracted Foreign Direct Investment (FDI) equity inflow of about US$ 8.57 billion between April 2000 and December 2018. Investments worth Rs 8,500 crore (US$ 1.19 billion) have been announced in India for ethanol production. By early 2019, India will start exporting sugar to China. The first mega food park in Rajasthan was inaugurated in March 2018. Agrifood start-ups in India received funding of US$ 1.66 billion between 2013-17 in 558 deals. In 2017, agriculture sector in India witnessed 18 M&A deals worth US$ 251 million. Prime Minister of India, launched the Pradhan Mantri Kisan Samman Nidhi Yojana (PM-Kisan) and transferred Rs 2,021 crore (US$ 284.48 million) to the bank accounts of more than 10 million beneficiaries on February 24, 2019. The Government of India has come out with the Transport and Marketing Assistance (TMA) scheme to provide financial assistance for transport and marketing of agriculture products in order to boost agriculture exports. The Agriculture Export Policy, 2018 was approved by Government of India in December 2018. The new policy aims to increase India’s agricultural exports to US$ 60 billion by 2022 and US$ 100 billion in the next few years with a stable trade policy regime. In September 2018, the Government of India announced Rs 15,053 crore (US$ 2.25 billion) procurement policy named ‘Pradhan Mantri Annadata Aay SanraksHan Abhiyan' (PM-AASHA), under which states can decide the compensation scheme and can also partner with private agencies to ensure fair prices for farmers in the country. In September 2018, the Cabinet Committee on Economic Affairs (CCEA) approved a Rs 5,500 crore (US$ 820.41 million) assistance package for the sugar industry in India. The Government of India is going to provide Rs 2,000 crore (US$ 306.29 million) for computerisation of Primary Agricultural Credit Society (PACS) to ensure cooperatives are benefitted through digital technology. With an aim to boost innovation and entrepreneurship in agriculture, the Government of India is introducing a new AGRI-UDAAN programme to mentor start-ups and to enable them to connect with potential investors. The Government of India has launched the Pradhan Mantri Krishi Sinchai Yojana (PMKSY) with an investment of Rs 50,000 crore (US$ 7.7 billion) aimed at development of irrigation sources for providing a permanent solution from drought. The Government of India plans to triple the capacity of food processing sector in India from the current 10 per cent of agriculture produce and has also committed Rs 6,000 crore (US$ 936.38 billion) as investments for mega food parks in the country, as a part of the Scheme for Agro-Marine Processing and Development of Agro-Processing Clusters (SAMPADA). The Government of India has allowed 100 per cent FDI in marketing of food products and in food product e-commerce under the automatic route. Sugar production in India has reached 27.35 million tonnes (MT) in 2018-19 sugar season, as of March 15 2019, according to the Indian Sugar Mills Association (ISMA). The Electronic National Agriculture Market (eNAM) was launched in April 2016 to create a unified national market for agricultural commodities by networking existing APMCs. Up to May 2018, 9.87 million farmers, 109,725 traders were registered on the e-NAM platform. 585 mandis in India have been linked while 415 additional mandis will be linked in 2018-19 and 2019-20. Agriculture storage capacity in India increased at 4 per cent CAGR between 2014-17 to reach 131.8 million metric tonnes. Coffee exports reached record 395,000 tonnes in 2017-18. Between 2014-18, 10,000 clusters were approved under the Paramparagat Krishi Vikas Yojana (PKVY). Between 2014-15 and 2017-18 (up to December 2017), capacity of 2.3 million metric tonnes was added in godowns while steel silos with a capacity of 625,000 were also created during the same period. Around 100 million Soil Health Cards (SHCs) have been distributed in the country during 2015-17 and a soil health mobile app has been launched to help Indian farmers. India is expected to achieve the ambitious goal of doubling farm income by 2022. The agriculture sector in India is expected to generate better momentum in the next few years due to increased investments in agricultural infrastructure such as irrigation facilities, warehousing and cold storage. Furthermore, the growing use of genetically modified crops will likely improve the yield for Indian farmers. India is expected to be self-sufficient in pulses in the coming few years due to concerted efforts of scientists to get early-maturing varieties of pulses and the increase in minimum support price. The government of India targets to increase the average income of a farmer household at current prices to Rs 219,724 (US$ 3,420.21) by 2022-23 from Rs 96,703 (US$ 1,505.27) in 2015-16. Going forward, the adoption of food safety and quality assurance mechanisms such as Total Quality Management (TQM) including ISO 9000, ISO 22000, Hazard Analysis and Critical Control Points (HACCP), Good Manufacturing Practices (GMP) and Good Hygienic Practices (GHP) by the food processing industry will offer several benefits. India exported nearly 20 million tonnes of foodgrain in 2012-2013, becoming a major contributor to the world's food basket. Solar energy generation in India: Lighting lives! Join IBEF.org now. Enjoy FREE subscriptions downloads, updates and more.